50 & sunny - spring is coming! Noble Custom was awesome enough to sponsor this review - Please head over to his site and peruse the goods! Like what you see? Use code “burn1” for 20% off your order. Note: As a disclaimer, neither myself nor anyone at Burn1 receive any kick-back on this deal - it’s simply a partnership to help promote each other’s ventures. Noble Custom donated a handful of cigars that I’ll be happily reviewing in the next few months. The Kato is a spin-off of Black Works Studio's Green Hornet line however it is a different blend than the Hornet. Katos have traditionally been a cigar only available at events - only recently have a few popped up for sale from vendors after quickly attaining a cult following. I reached out to BLTC - they maintain this is strictly an ‘event only’ cigar. We are very excited to launch these new additions to the Killer Bee and Green Hornet lines. These cigars will be released as event only in very limited quantities. Both of these cigars are unique versions of the original blends and highlight the creativity of our factory. I wanted something special for our retailers who support us with events and these two cigars are exactly that. Black Works Studio was launched by Brown in 2015 as an outlet to be able to push his creativity. He refers to it as his opportunity to have a creative playground within the factory. While he started it to highlight Nicaraguan tobacco, he certainly has not shied away from bringing in other regions' leaves. While Kato is not necessarily a limited edition cigar, it is a limited production cigar. It is rolled in small batches and released periodically through the year. There's no doubt Brown is a prodigy cigar blender - BLTC / BLK WKS consistently kicks out great smokes - but, he also seems to have a flair for marketing. The boxes and bands from Black Label are expertly created to achieve instant brand recognition. I also love that so many of their cigars are easily identifiable based on the cigar alone! That in my eyes, is truly unique and remarkable. The Kato maintains the same language as the Green Hornet line - rocking camo green and gold foil on a black background. One cool thing to note about the box - it displays the blend info on the side. Very cool to see on a cigar you may struggle to find much info on. The band itself resembles the box - a matte black background with the same camo green text spelling out "green hornet" and a plan view of a hornet in matching green. It is complimented by a geometric pattern and some boundary lines in gold foil. 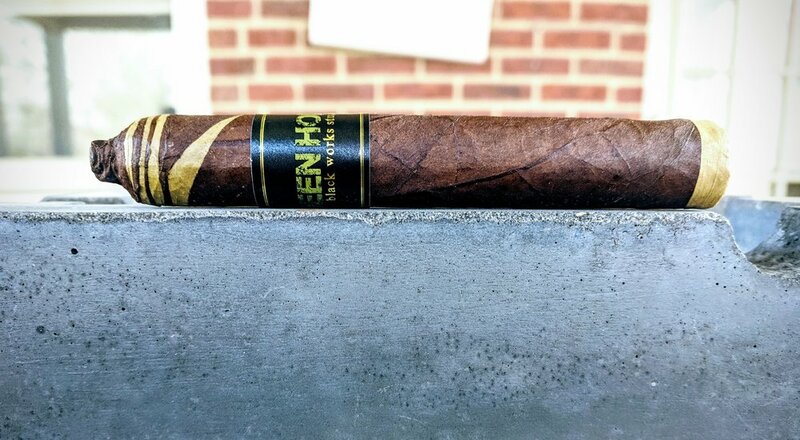 The green/gold coloration pairs up remarkably well with the candela highlights on the cigar itself. Gorgeous presentation of a phenomenal cigar! The Kato is wrapped in a dark, toothy Ecuadorian maduro wrapper and, of course, accented by artistically applied candela on the cap and foot. The wrapper itself has a great oily sheen. It's got just a slight variation in color - ranging from a deep, chocolate brown to a darker, coffee bean tone. Veins stand out as a darker color against the lighter brown but aren't noticeably raised or distracting. I never mind vein visibility - it's a great reminder that the cigar you're smoking started as a plant, something imperfect and natural. Aesthetically, this is one of the coolest, prettiest cigars you'll find - second only to La Flor Dominicana's Salomon Unico line. The Kato is a very firm cigar. When lightly compressing there is almost no give to the body. There are also no soft spots - all signs pointing to a well-rolled cigar.The cap is nothing short of a work of art. 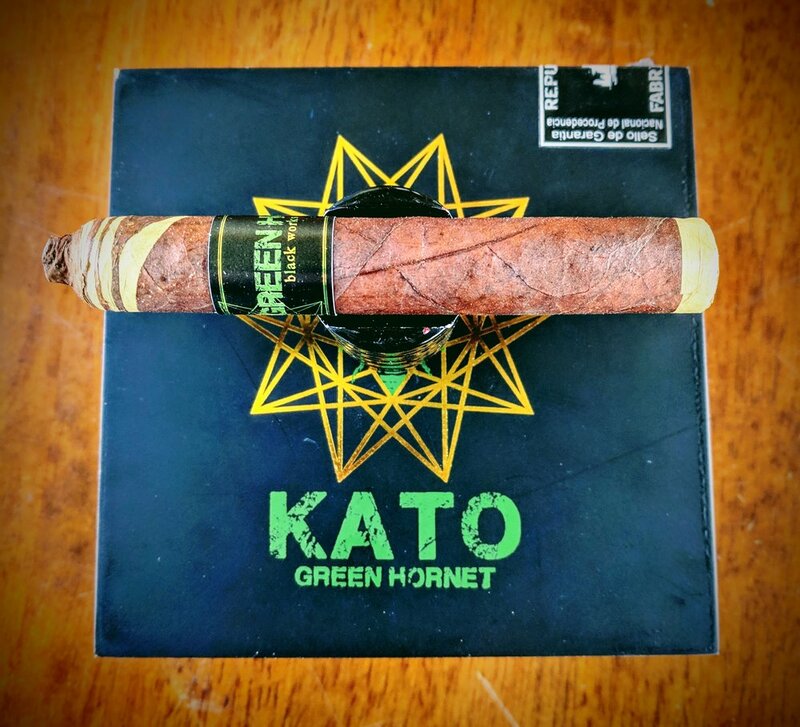 The Killer Bees and Green Hornets from Black Works Studio always bring a fun, similarity to the insects they're draw their names from but Kato introduces the candela spiraling down into the body along with a pointed cap. It's easy to imagine the amount of time and work that goes into producing cigars of this aesthetic consistently and with this degree of skill. The candela is so seamlessly woven into the maduro wrapper it almost looks like it's painted on to the darker surface - just beautiful. The unfinished foot is wrapped in additional candela leaf. The maduro paired with the candela should be an awesome flavor combination. These wrapped, unfinished feet always intrigue me - I love the little blast of wrapper leaf you get when lighting up. It's a fun nuance to add to the lighting experience. The candela adorning the foot has an amazing smell - it's like spring in the air - great lemony, hay elements. After clipping the cap, there is some additional sweetness - more along the line of sweet chocolate and citrus with a little bit of faint cedar. I am always surprised at the openness on draws with a wrapped up foot. Kato brings plenty of air to the mouth - no concerns about the draw. Once the flame hits the candela the flavors pop immediately - most notable are fresh grass and some light pepper. The draw is perfect - tight enough to force you to pull the smoke to your mouth but still allowing plenty of air to move through - classic milkshake resistance. As the candela burned off, there were moments of uneven burning but as the fireline hits the maduro it has slowed and evened out nicely. The first couple layers of ash are very dark and grey - maybe hint at those volcanic ash dusted growing fields of Ecuador. Smoke production is on the high side. Once it's lit, this little fella keeps churning out a plethora of great smelling white smoke. The pepper steps into a dominant role but is backed up nicely with some meaty char, coffee bean bitterness and a bit more of the citrus and hay present on the palate - perhaps it’s the candela poking through. Also entering the scene as I work through the first half - a healthy dose of chocolate. There's no shortage of flavor popping out of this tiny stogie - all of them are phenomenal and playing very well together. Retrohaling highlights the pepper, as it often does, but brings in some cinnamon and cedar as well. The draw could not be better - loving it so far. The burn line has flat-lined .... you know, in a good way. Razor thin and perfectly even - zero to complain about or correct. The first chunk of ash held for just shy of an inch before neatly dropping - nice and sturdy. Around the midpoint, the overarching flavor continues to be a dominant pepper present. Working in tandem with that pepper, there's some hot cinnamon (like the spicy cinnamony candies) along with a continuation of various charred/burned stuff - meat, citrus zest most notable. Towards the end of the third, the pepper starts to wane and the other flavors really start to shine under the newly developing creamy notes. While the draw has remained unbeatable, the burn line has started to zig and zag slightly. Nothing too concerning but some peaks and valleys are starting to develop. The ash continues to build about an inch at a time prior to dropping. It's a marbled white, grey and black ash that stacks gorgeously. As noted above, the pepper, while still lingering, has taken the backseat to a creamier flavor profile. The pepper continues to sit at the back of your throat but gets married into a savory, cedar profile punctuated by some notes of burnt sugar and just a little zest/grass leftover. Typically, I veer away from spice-bomb cigars, so this reprieve from the pepper is definitely appreciated however, I think the pepper pairing so well with the other flavors really helped to keep me on-board. Now, with the pepper's departure, the flavor profile shifts entirely to a much lighter feeling cigar. The burn has completely evened out yet again - just a perfect experience. The flavors are more easily divided into halves - not so much a progression through thirds. The candela compliments the experience throughout and the sharp shift from pepper to cream is the easiest transition to identify. That said, there are plenty of nuanced flavors continually dancing on the palate. The peppery charred notes complimented by a host of slightly sweeter flavors are magnificent. The burn experience is never something meriting a second thought - from lighting to finish, it burned consistently and flawlessly. It has been a joy to smoke through and through. It's no wonder that once these hit people's lips, BLTC was overwhelmed by mobs of cigar smokers demanding more beyond event availability. They listened and delivered! For around $9 these are easily one of the best bangs you'll ever get for your buck. If full-bodied, complex cigars are your thing, you owe it to yourself to track some Katos down and load up. They are a phenomenal cigar with flavors out the wazoo and IMPECCABLE construction. Even more amazing is that these characteristics are all wrapped up in one of the most beautiful cigars you will ever lay eyes on. I love reading other reviewers' thoughts on the cigars I'm smoking and reviewing. Unfortunately, there’s not a ton of other reviews or even much info out there for the Kato. If you find a review, please drop me a note below!